The house, surrounded by its own 25 acres of woods and fields, is a 400 year old former farmhouse, that has been completely rebuilt. It is set on on a hill, with a 180 degree vista. It’s a great view! La Casina (little house) was built into a hill on its own 25 acres 400 years ago. Fanciful, but it is possible it was built there to take advantage of the 180° view of other rolling hills and farms. Facing the house in the distance is one of the oldest castles in the region. The village lights are just visible at night yet La Casina is just 7 minutes away by car. 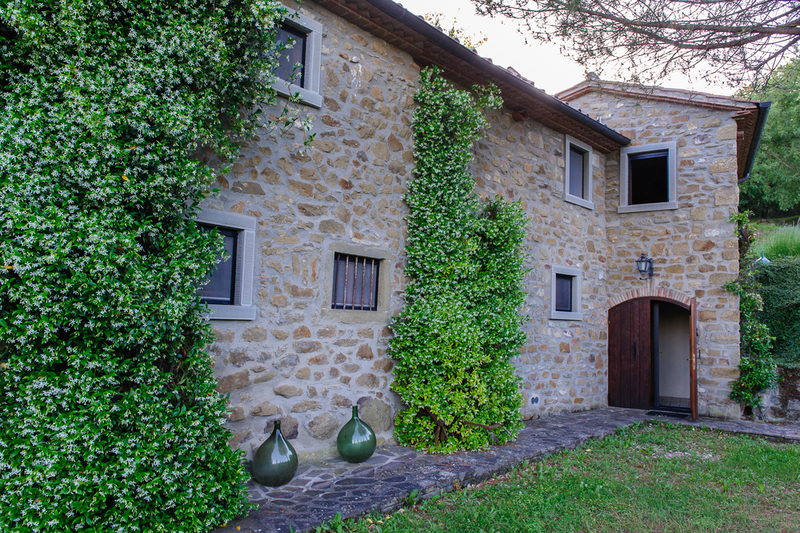 Such an independent house, built for one family, is unusual; most houses in Tuscany, often called villas, contain several separate apartments sharing the same building and terrain. Here, privacy is guaranteed! Going through the main double doors on the lower level is the foyer which leads to the kitchen and dining room. Down the hall are a bathroom with bathtub with shower and washing machine, and a bedroom with twin beds. Upstairs you will find the living room, library (called “the Lost Room’’- long story), a large bathroom with walk-in shower, and a bedroom with queen-size bed. The Lost Room has a sofa-bed and can serve as a double bedroom. The slope of the hill allows for an outside door in the living room. Outside, you will find the pizza oven to your right. and the entrance, five feet away and separate from the house, a very small building, L’Apostropho. Its upper level is a bedroom with twin beds; the lower room is used for storage. 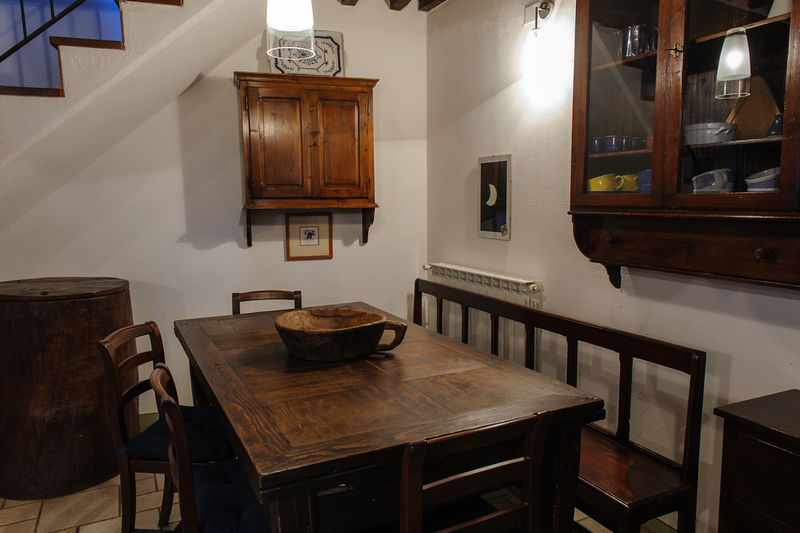 The house has many classic Tuscan antiques and original art by local artists. Chestnut wood, with its rich caramel colour, was used for all the custom made windows and doors. The kitchen is modern and well equipped with every utensil imaginable for cooking and feeding a crowd. The dining table holds 10 comfortably. The library is full of novels, books about Tuscany, and binders with information about places to visit in the region. La Casina has a telephone, hair dryers, an iron and an ironing board. All linens and towels are provided. Internet service can be found at the local internet caffé or can be accessed through the purchase of an inexpensive mobile internet stick, available nearby. The house is suitable for up to 8 guests. And there is parking for probably 20 cars; the person creating it thought he’d discovered an Etruscan wall and kept excavating.... You might need all that parking if you use all the places near the house to entertain. From the front door are olive trees, a small hill of rosemary and lavender and a rampant sage which needs to be restrained by using it in cooking. The well named umbrella pine provides lots of shade. Circling much of the house is a row of Cyprus trees interspersed with rosemary. Outside the living room on the upper level you are treated to 3 terraces dominated by a huge, very old oak tree, with more olive trees, fruit trees and spectacular views in 3 directions. There is so much to experience in Anghiari and Tuscany, but often the temptation is to stay put and drink in your immediate surroundings.